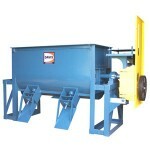 Davis Mixers are used to produce drywall compound products (both Wet and Dry) . The wet products are mixed with our Paddle Agitator and then pumped into pails or barrels through a Moyno Pump. 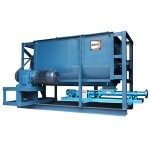 The dry products are mixed with our Double Ribbon Agitator and then sent to bulk load out or packaging equipment. Please contact us for more information and pricing.